Alexis-Charles-Henri Clérel de Tocqueville was a French political thinker and historian best known for his book Democracy in America. 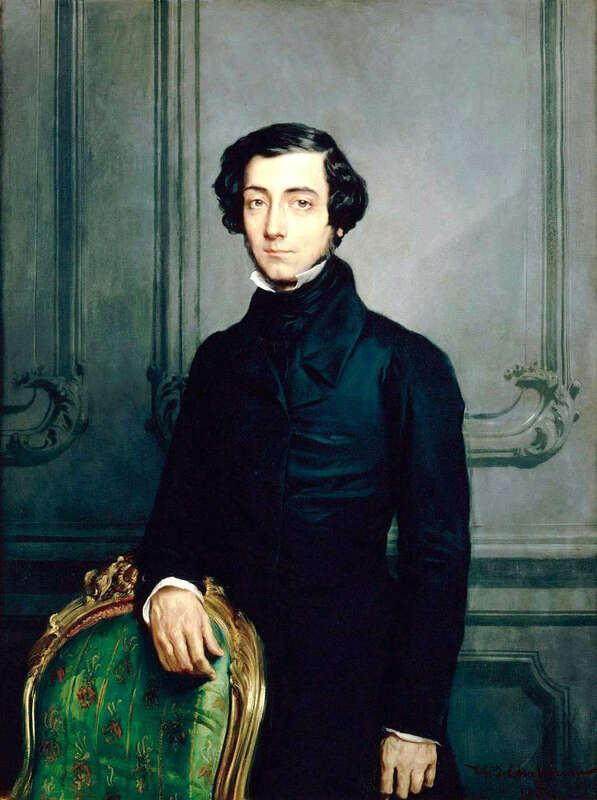 In Democracy in America, published in 1835, Tocqueville wrote of America and its growing democratic order. He saw democracy as an equation that balanced liberty and equality, concern for the individual as well as the community. America grew and thrived precisely because of that principle. Liberty and equality were balanced–though not perfectly. Most people of that age placed the good of others either ahead of or equal to their own. What happens when people reject God–the moral foundation of their society? Benjamin Franklin said that as nations become more corrupt and vicious, they have more need of masters. The apostle Paul, speaking to the church at Rome, spoke of those who rejected God and the consequences of that rejection. Paul goes on to talk about the character of people who have so completely rejected God. The consequences he states in the following verses are the judgement of God, resulting from God abandoning them to their heart’s desires. One does not have to look farther than the newspaper or television to see what happens to a society that rejects its moral underpinnings. Can we see injustice, wicked behavior, greed, rudeness and pride? These are signs of a society in decline–the decline of the ungodly. In this situation of this Assembly, groping as it were in the dark to find political truth, and scarce able to distinguish it when presented to us, how has it happened, Sir, that we have not hitherto once thought of humbly applying to the Father of lights to illuminate our understandings? In the beginning of the Contest with Great Britain, when we were sensible of danger we had daily prayer in this room for the divine protection. Our prayers, Sir, were heard, & they were graciously answered. All of us who were engaged in the struggle must have observed frequent instances of a superintending providence in our favor. To that kind providence we owe this happy opportunity of consulting in peace on the means of establishing our future national felicity. And have we now forgotten that powerful friend? Or do we imagine that we no longer need his assistance? Can you think of some examples of “inappropriate things” that result from rejection of God? Next month we’ll look at some examples. -Steve keeps busy with five children and a job in information security. He also has a second job as principal of the Hodgepodge homeschool. Steve is the principal of the Hodgepodge homeschool. In his spare time, he works in the information security field. So appreciate your thought-provoking post! I definitely see the signs indicating a decline in our society. Prayers for our world, seeking God and His will, and striving to be a light are what help me in the midst…. Wonderful post of quotes and scriptures. I enjoyed reading it this morning.